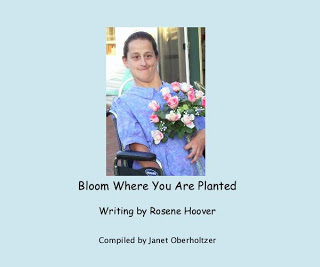 This book is compiled of writings from my sister Rosene, along with some information about her life – it contains her writings I posted earlier this week, along with many more. Rosene lived on earth for 39 years with too many limitations and too much pain, due to Cerebral Palsy. In her twenties, her motto became “Bloom Where You Are Planted” and she did! She put her thoughts in writing, ranging from What is Normal to Her Prayers and many more. She enjoyed people, whether it was her family or her friends. Through the good and bad, she trusted that someday things would be better, so she did what she could with what she had. Last year on this date, doctors told us that Rosene would not be able to live (breathe and eat) on her own after complications from a needed surgery. Our first instinct was to do all we could to keep her alive – but Rosene had been clear about her desires to all of us and in a living will, so we honored her wishes to not prolong her life with machines. She passed away the next morning – October 22, 2008. We miss her, but are so thankful she is finally free of pain and limitations. She loved butterflies – so I imagine she’s dancing with Jesus with beautiful butterflies all around them! I compiled this book after her death – I’d read most of her writings, but I found some on her computer that I hadn’t seen before. You can preview the first 15 pages of this book at Blurb. Leave a comment with your email address today and you will be entered in the drawing. I will post the winner on Friday morning. I wrote about Rosene’s life this past week – here are those posts. Thank you for dropping by my blog yesterday … it seems you have known much of what it means to trust the Lord in the time of adversity.